Sawgrass is not a true grass. Sawgrass (Cladium jamaicense) is not a “true” grass, but actually a member of the sedge family, characterized by sharp teeth along the edges of each blade. Sawgrass once covered the northern portion of the Everglades, growing to heights of over 9 feet (2.7 m) tall on the rich, dark peat soils. However, today much of this land has been drained and cleared and is used to grow sugarcane. There are some protected areas within designated conservation areas that include sawgrass. Sawgrass is also found throughout the southern and central regions of the Everglades. Sawgrass marshes are usually flooded with water for most of the year. This hydroperiod, along with the depth of water, determines the growth of sawgrass. 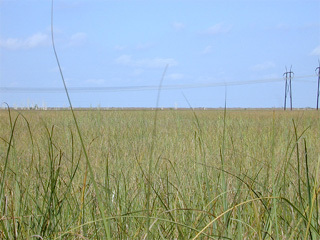 A longer hydroperiod along with increased water depths produces taller, thicker stands of sawgrass while a short hydroperiod and shallow waters result in limited growth. 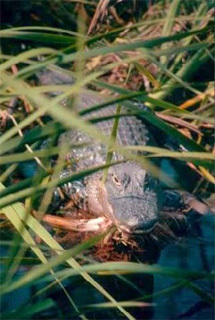 Dense areas of sawgrass have low species diversity, with alligators often nesting in these habitats. During the majority of the year, wet soils protect sawgrass roots from damaging fires. While the above-ground plant tissues are burned, the wet roots are able to survive, allowing the plant to make a complete recovery. Fires play an important role in sawgrass habitats by limiting the invasion of woody vegetation that would eventually change the marsh into the next successional habitat. peat: partially decayed plant matter formed on the surface of water-logged soils, used as a fertilizer, fuel, or in the production of charcoal. hydroperiod: the period of time during which a wetland is covered by water. successional: predictable changes in community composition following a disturbance that opens an environment to colonization.